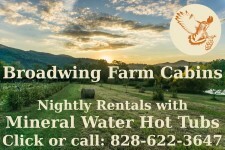 If you have been looking for the perfect log cabin rental in the Hot Springs and Asheville area, YOU HAVE FOUND IT!!! Our mountain getaway is surrounded by the Pisgah National Forest. The French Broad River flows right below the small bluff we perch on overlooking the Blue Ridge Mountains and you have private access to the river! We are a short, very scenic drive along the river to the town of Hot Springs. The drive to Asheville is an easy, 45 minutes of beautiful mountain farm land scenery. This is not a sterile vacation rental; this log cabin is filled with unique finishing touches designed to give you a true North Carolina mountain getaway experience. Enjoy a sunny deck or a screened porch with fans as you relax in the privacy Paint Rock Cabin offers. Linens and kitchenware are provided, and well-behaved pets are welcome to enjoy the mountains. The master bedroom offers a Queen sized bed and a Jacuzzi Tub, while the downstairs room offers two daybeds with trundles that can be configured in multiple ways, including 4 twins or two kings or the kid favorite, Giant Super Bed. Terraced garden beds are wonderfully landscaped with different flowers blooming throughout the growing season. A fire pit is located in the woods, and a hammock always begs for a breezy nap.